One of the great joys of Scotland is that you can still find places where the influence of modern man is not overwhelmingly obvious. To do so you usually have to head north or west; climb a mountain; or sail to an island. But as you walk the few hundred metres along the track leading to Crichton Castle you realise that this lonely stretch of the River Tyne valley is empty except for the castle looming up ahead of you, and its collegiate church among the trees behind you. Nothing built by man in the past 500 years can be seen in this extensive landscape: and this is within 15 miles of the centre of Edinburgh. 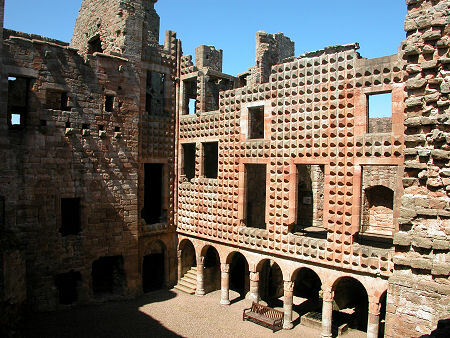 Crichton Castle's unexpected sense of isolation is in itself enough of a reason to visit, but there are others. 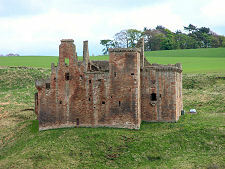 The castle is usually approached along the B road from the A68 at Pathhead. Keep on following the brown tourist signs in Crichton itself and you are led along increasingly narrow roads to a car park beyond Crichton Collegiate Church, built in the years up to 1449 by William Crichton, the Lord Chancellor of Scotland. Now minus its original nave, this is otherwise a remarkably complete medieval church. 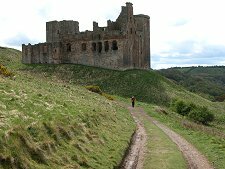 Crichton Castle is visible from the church and the car park, and lies some 500m along a good quality track that leads you along the side of the River Tyne valley and below the north and east faces of the castle. The best views of the castle are from the hillside to the east, which both overlooks the castle and leaves you wondering how vulnerable it might have been to artillery attack from this side. 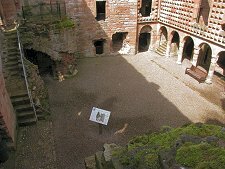 Dominating the east side of the castle is a survivor of the original structure, the tower house that would originally have been surrounded by a fortified courtyard or barmkin. If this central block looks brutal today, imagine how it would have looked originally. 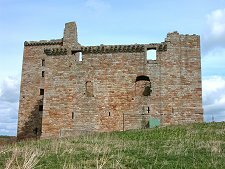 When first built by the Crichtons in 1400 it was half as tall again, 75ft rather than the 50ft it was reduced to by later alterations. 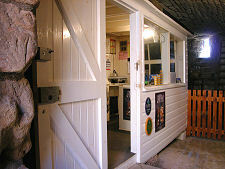 Within the defensive barmkin wall would have been a number of outbuildings serving the tower house. An early owner was William Crichton, Sheriff of Edinburgh, Keeper of Edinburgh Castle and Chancellor of Scotland. And a man not above inviting the 6th Earl of Douglas and his younger brother to dinner at Edinburgh Castle in 1440 before having them both killed. 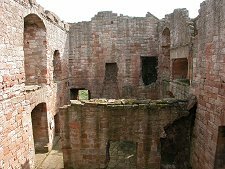 In retribution the Douglases stormed Crichton Castle and severely damaged it. 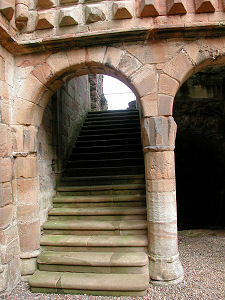 By 1450 William Crichton had not just repaired Crichton Castle, he had also greatly extended it. In doing so he built most of the castle you see today. 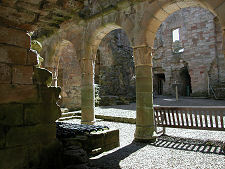 The existing tower house was complemented by three new ranges surrounding a courtyard and a south west tower, and within the south range he built a great hall. He also built the collegiate church at the same time. In 1479 William's son, also William Crichton, had an affair with the sister of James III, who duly produced a child. The King was further displeased when allegations were made in 1484 that Crichton was plotting against him: and the family's titles and possessions were forfeited. 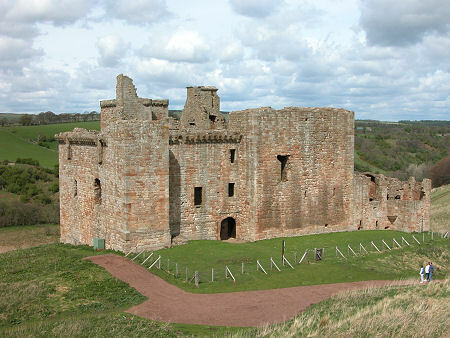 Crichton Castle was among a number of properties bestowed in 1488 by James IV on the Earl of Bothwell. Over the following century Crichton was largely by-passed by the main flow of Scottish history, though it was successfully besieged by Protestant Lords in 1559 after the James Hepburn, 4th Earl of Bothwell intercepted 4000 English crowns sent by Queen Elizabeth to help fund the Protestant cause. The 4th Earl of Bothwell is better known for becoming Mary Queen of Scot's third husband in May 1567, precipitating her fall from grace and her abdication. The Earldom of Bothwell was withdrawn in 1567, and in 1581 it passed to Francis Stewart, a grandson of the 3rd Earl. He set to work transforming the castle into a Renaissance mansion, heavily influenced by his earlier travels in France and Italy. 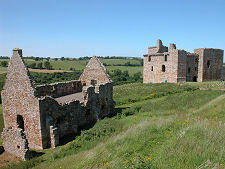 His main contribution was the rebuilding of the north range, but he made alterations to much of the rest of the castle including lowering the tower house and subdividing the great hall in the south range. 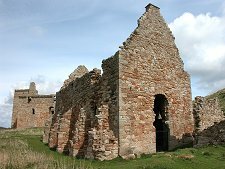 To the south of the castle he built the stable block whose shell, often mistaken for a chapel, still stands. 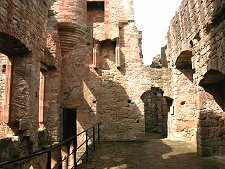 As you enter Crichton Castle the most remarkable aspect of 1580s work becomes immediately obvious. 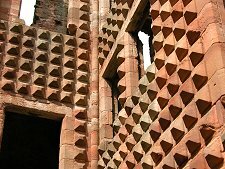 The diamond-faceted red stonework facade on the north range is truly amazing and has become Crichton Castle's trademark feature. To 21st Century eyes it suffers from its likeness to the sort of concrete paving placed in areas the Council don't want you to walk. 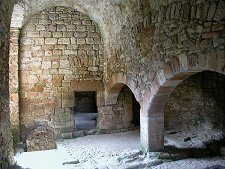 But remember that what you see in Crichton Castle was carved from stone, not cast from concrete: and was put there long before the phrase "street furniture" entered the language.